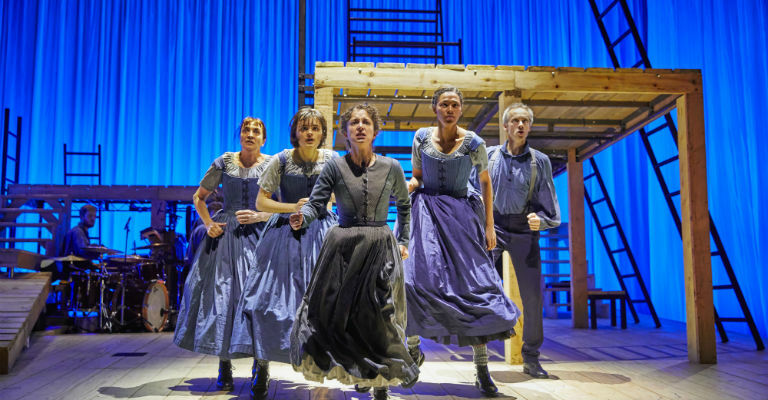 This new, imaginative live adaption of Jane Eyre is both brave and incredibly well thought through, with Sally Cookson adapting one of Britain’s most loved classics into a phenomenal on stage production. Cookson strips back Brontë’s masterpiece to its bare bones and it is not one to be missed. Just in case you haven’t read the novel, Jane Eyre follows a young orphan girl into adulthood. Her early years are devoid of kindness and love; she craves the affection that has been absent since the death of her parents, but also has an unquenchable thirst for knowledge. The older she gets, the more unsettled she becomes, and eventually becomes a governess at Thornfield Hall to educate Mr Rochester’s French ward Adele. This is when Jane falls head over heels for Mr Rochester. Their unrequited love was positively scandalous for the 1840s, especially when it came to life that the author was in fact a woman. Cookson’s adaption is quite different from a lot of previous productions, as her play is focused more on Jane’s growth rather than as heavily on the romance with Rochester, which is a refreshing change. The fantastic Nadia Clifford brings Jane’s tenacity and modern principles to life, encompassing the role whole-heartedly and making Jane anything but plain. The whole cast is incredible, fluttering from character to character seamlessly, completely ignorant of gender, race, age or species. Throughout the play, the incredibly talented Melanie Marshall (aka mad woman extraordinaire Bertha Mason) narrates emotions through musical interludes. Her voice is beautiful and performances are hauntingly mesmerising. A perfectly ironic narrator – someone who apparently has lost her mind but can perfectly pinpoint the emotions of those living in freedom beneath her. In terms of set design, I was expecting to walk into the theatre to a period depiction of Jane Eyre, but instead I was greeted by a modernised script and a naked, wooden, industrial structure where a Victorian Thornfield Hall could have been. The set has a certain vulnerability to it; every move is exposed and under the microscope but the props seem to appear out of nowhere. In a way, the stage is very much like Jane herself, vulnerable but with secrets and a strong presence. It is visual confirmation of an unexpected adaption that works on every level. “I am no bird; no net ensnares me: I am a free human being with an independent will.” There are no walls confining the talent of this production – from start to finish it’s wonderful. Every detail has been meticulously considered, from the musicians in the middle of the stage to the fiery red of Bertha Mason’s dress. Jane Eyre is a must watch.